The Tiny Bang Story HD from Colibri Games for iPad is a unique puzzler that will be either loved or loathed by gamers. There is no text in this game, and it contains no hints or tips anywhere. You just move from puzzle to puzzle without directions or typical gameplay progression. Multiple riddles fill the screen. As you think you move forward, you discover a new puzzle and find yourself scrambling back to the beginning to fully reveal the puzzle. If you like to solve a mystery with elusive visual clues, then Tiny Bang Story HD may just be the game app for you. The story behind the Tiny Bang Story HD app is an idyllic, nursery rhyme landscape has been destroyed by a meteor. You are left to pick up all the pieces and rebuild. In the cool opening movie, you see a lush Super Mario type of world–round, green, cheeky, and bright. A meteor smashes into a soccer ball floating through space. The meteor and soccer ball then obliterates the world into puzzle pieces. The game simply opens on an Old Woman Who Lives in a Shoe landscape. You see puzzle pieces in the landscape, and there is a puzzle piece tally in the right upper portion of the screen. You start tapping puzzle pieces, closing and opening doors, discovering more puzzle pieces, and moving forward. Then, you may hit a handle on a pot, and you have found a new group of items to find. There are pipes where you travel and uncover more puzzles and items to find. There are more than 30 puzzles to unravel and five different unique landscapes. The Tiny Bang Story HD app for iPad is visually stimulating, but you have to be a motivated, puzzle-crazy user. The pace is totally dictated by your puzzle prowess. Aside from tapping around and scrolling through the world, there is little action to the Tiny Bang Story HD app. 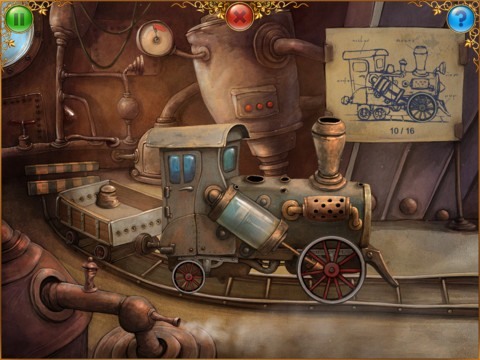 If you want fast-paced, interactive puzzle play, then Tiny Bang Story HD’s iPad app may not be for you. If you like straightforward directions and explanations for game play, then the Tiny Bang Story HD may not be for you either. If you live dangerously and thrive without directions, then the Tiny Bang Story HD iPad app will be totally worth the $2.99 iTunes App Store download price. Otherwise, you may want to be on the lookout for other puzzler apps for your iOS mobile device. 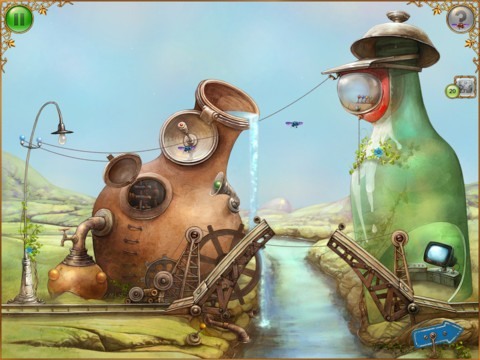 AppSafari review of The Tiny Bang Story HD was written by Jenni Ward on April 18th, 2012 and categorized under App Store, Games, iPad apps, Puzzler. Page viewed 4000 times, 1 so far today. Need help on using these apps? Please read the Help Page.